UNIVERSAL VOLTAGE AND FDA APPROVED – Universal Voltage, 100 to 240V~50/60Hz: Allows you to take it with you when you travel abroad. Gurin Water flosser is FDA approved and comes with easy fill water tank. CUTS FLOSSING TIME IN HALF – We guarantee a more thorough clean in less than half of the time compared to traditional string flossing. CONVENIENT – Gurin Flosser includes a lightweight full waterproof design and rechargeable lithium ion battery for years of continuous use. Gurin Flosser fully charges over night and will last for weeks of continuous use. SUPERIOR FOR BRACES – Gurin Flosser is ideal for those with braces or other dental devices as its 360 degree rotary tips can reach places that traditional floss can’t. The result is a superior and more thorough clean in half the time. 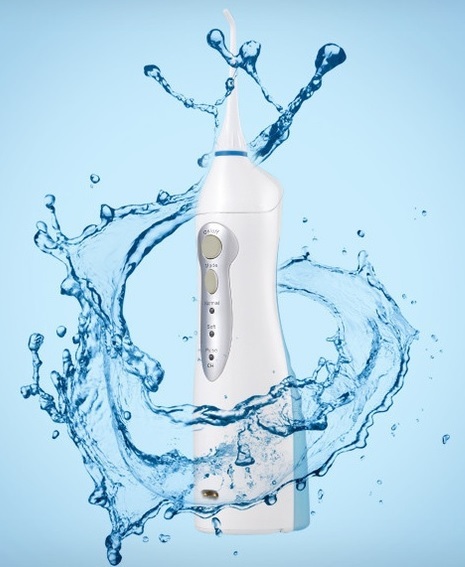 The Newly Redesigned Gurin Professional Oral Irrigator provides easy and effective way to support proper teeth and gum health at home. 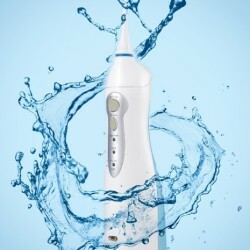 Our Oral Irrigator now comes with Rechargeable Lithium batteries, This gives you much more power and battery life. Daily irrigation helps reach places brushing simply can not, promoting cleaner teeth and healthier gums. The result, an incredibly clean, fresh happy mouth. Irrigating is easier and less abrasive than string floss. This irrigator is a powerful water jet which helps remove debris deep between teeth and reduces the risk of bacteria build-up in crevices and below the gum line. Add in a little mouthwash for an extra fresh feeling. Irrigating is great for hard to reach spots, especially for people with bridges and braces. The irrigator comes with 2 interchangeable nozzles, great for multiple users. Three operating modes are useful for varying oral care needs: Normal, soft and pulse. Pulse mode comfortably massages the gums. The extra large reservoir is removable and easy to refill. Cordless design powered by rechargeable batteries. WHY IS GURIN FLOSSER BETTER? b) Easy to Fill Water Tank – Gurin Water Flosser has wide opening on the back of the water tank. Just pop that open and quickly fill your irrigator. d) Easier to remove tips – Gurin Flosser now has tip release button. Just press and your tip is released. e) Lightweight, Rechargeable and Universal Voltage – Lightweight Gurin Flosser is rechargeable and supports voltage from 110V-240V, Great for Travel! Q. How do I change the nozzle of Oral Irrigator? Q - Where can I re-order replacement heads/nozzles?